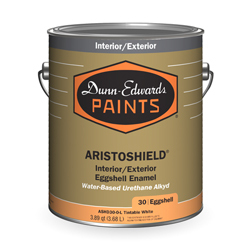 EVEREST® is a complete line of ultra premium, low odor, Zero VOC, self priming, 100% acrylic paints ideal for use on high-end residential and commercial projects. 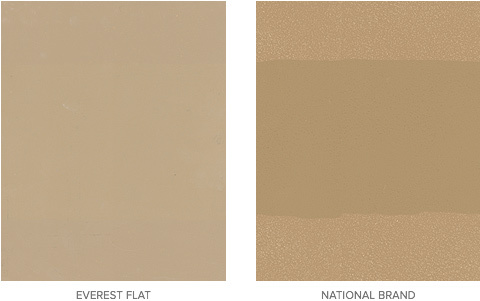 They apply easily and feature exceptional hide, superior scrub resistance, washability and adhesion. EVEREST® outperforms other brands in durability after repeated scrub cycles. That means the painted surface will maintain its original appearance longer. Paints are applied to black charts. After drying for seven days, the charts are placed in an abrasion testing machine and stopped at the indicated cycle. Complete deterioration occurs when a full line of black background is exposed. 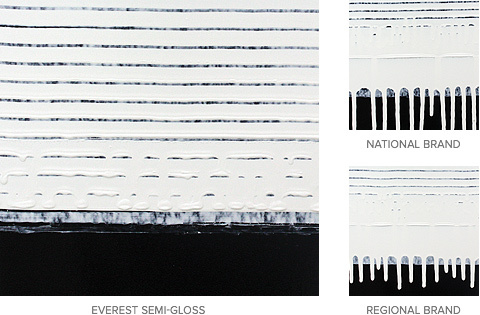 EVEREST® has better sag resistance compared to competitive products of the same gloss level. Excellent sag resistance means that the paint dries to a smooth, tight, uniform finish without the presence of heavy sag or drip marks. Paints are applied to test charts with a special multi-notch applicator (a drawdown blade with a series of notches of successively higher clearance). The charts are immediately hung vertically with the drawdown stripes horizontal, similar to rungs on a ladder, with the thinnest stripe at the top. After drying in this position, the drawdown is examined and rated for sagging (top stripe=4 mils, bottom stripe=24 mils, each stripe from top to bottom represents 2 mil increase in film thickness). 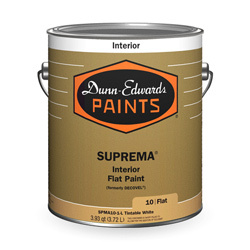 When two painted surfaces come into contact, such as a door and door jamb, they can stick together, or block. When that happens, the paint can peel from the surface. 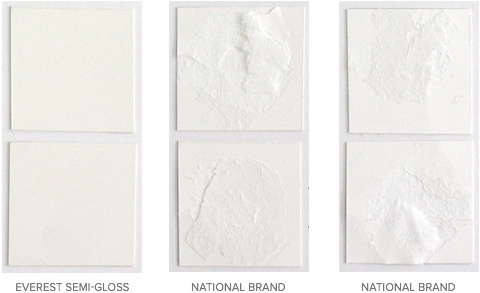 EVEREST® clearly beats the Regional and National Brands, as their paint is sticking together and peeling from the surface. EVEREST® outperforms the competition in applied hide. Good applied hide ensures that maximum hide is achieved when the paint is rolled so that fewer coats are needed to complete the project. 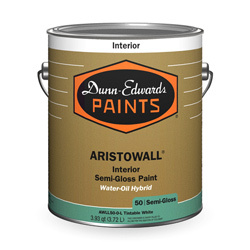 A 4´x 4´ drywall board is primed with a white acrylic primer. After allowing the primer to dry for 24 hours, varied shades of painted black to gray stripes are applied to the primed drywall (evenly spaced). After 24 hours, the first coat is applied to the test boards by brush (on the edges) and roller (across the center). After 1 hour dry time, the second coat is applied by roller (across the center) and the results are evaluated. 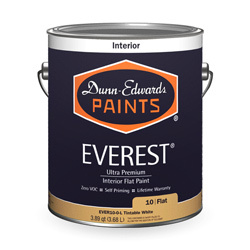 It is always recommended that EVEREST® be used over properly prepared and primed surfaces.